Clear Channel are delighted to introduce their new premium format Adshel Plus as a complement to their very popular Adshel Bus Shelters. Adshel Bus Shelters deliver outstanding coverage and frequency targeting people out and about nationwide. There are also Adshel Plus panels in the centre of the commuter towns of Cavan, Gorey and Tullamore. 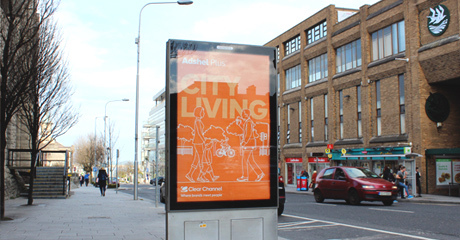 Adshel Plus can be bought as a pack where advertisers feature on one panel of the scrolling unit across 10 locations (5 Dublin and 5 Limerick). There is also the option to take all 4 faces on the 10 locations for special scrolling innovations.